Analog circuit design is a complex, error-prone task in which the processes of gathering observations, formulating reasonable hypotheses, and manually adjusting the circuit raise significant barriers to an iterative workflow. 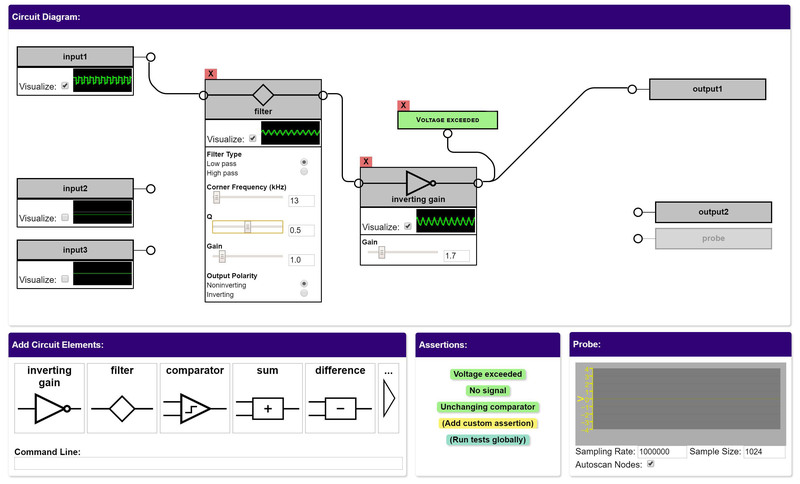 We present Scanalog, a tool built on programmable analog hardware that enables users to rapidly explore different circuit designs using direct manipulation, and receive immediate feedback on the resulting behaviors without manual assembly, calculation, or probing. Users can interactively tune modular signal transformations on hardware with real inputs, while observing real-time changes at all points in the circuit. They can create custom unit tests and assertions to detect potential issues. We describe three interactive applications demonstrating the expressive potential of Scanalog. In an informal evaluation, users successfully conditioned analog sensors and described Scanalog as both enjoyable and easy to use.